We are located just north of Birmingham, Alabama. Our specialty is in raising F1 English Cream Teddy Bear Goldendoodle puppies and F1B Goldendoodles. We are hobbyists who are dedicated to raising Goldendoodle puppies with great temperament, health and conformation. We have many years of experience raising puppies. Our puppies are highly socialized in a very loving home environment. Some of our Goldendoodles are service dogs to children with Autism and others with health problems. Some are Therapy Dogs. Our parents are part of our family as well as our puppies. The parents are AKC and CKC registered. Your puppy will have a full vet exam, two rounds of shots and deworming before coming to his or her new home. We also offer a comprehensive health guarantee. All puppies are registered CKC. We do Genetic Health Testing and all of our Parents have tested Clear of any Genetic Defects. We do have a Spay/ Neuter Contract with limited breeding rights. Why the English Cream Teddy Bear Goldendoodle? Because they are from the European lines that are noted for a calm easy going temperament and better health.They have the classic Goldendoodle blocky head with rounded eyes hence the name Teddy Bear. We raise F1 English Cream Teddy Bear Goldendoodles. This means they are a cross between a Poodle and an English Cream Golden Retriever. We also raise f1B English Cream Teddy Bear Goldendoodles.We are looking for loving homes to adopt these precious puppies. If you are interested in adopting you are put on a list for upcoming litters or you can reserve a puppy with a 300 deposit. Your deposit secures your choice and position in the litter. Deposits are Non-refundable but can roll over to another litter. I always reserve first right to any puppy from a litter. We reserve the right to substitute a similar sire for a planned litter should one sire be deemed not able to breed at a specific time. We do allow visitors on Open House Day after puppies have had their first shots and a full vet exam. 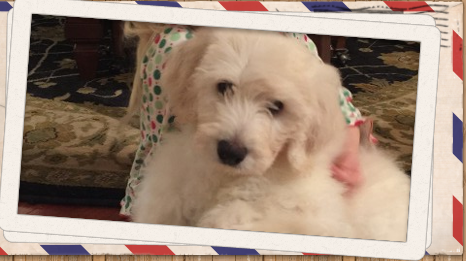 You can contact us at jeffersondoodle@gmail.com or call Julie at 205- 789-8047 or Please feel free to e-mail or call with any questions you may have about our Goldendoodles.